Maui Jungalow: How to Make House Cleaning More Fun: A Hula Maid - or Two! 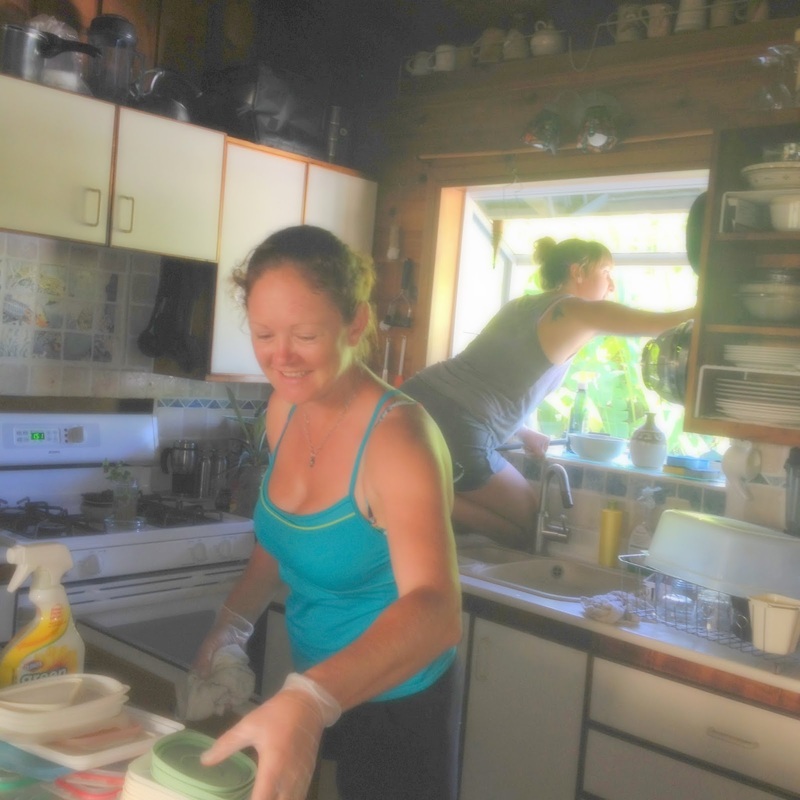 I’ve often complained about the challenges of keeping a house clean on Maui. It’s hard work, because the dust and dirt reproduce constantly. 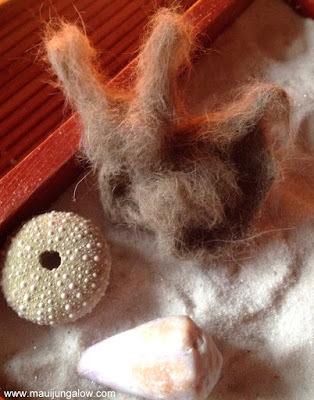 There’s a reason we call them dust bunnies – they’re always breeding. Insolent dust bunny on Maui. So I was thrilled to be contacted by a new cleaning company on Maui called Hula Maids. What a great name. It sounded so upbeat, like maybe the cleaners would dance hula while cleaning, like Snow White whistling while she worked. I’m often not cheerful when cleaning, more like Grumpy Dwarf having a hangover. I think it’s because I secretly resent the dust bunnies being on an endless tropical honeymoon on Maui. 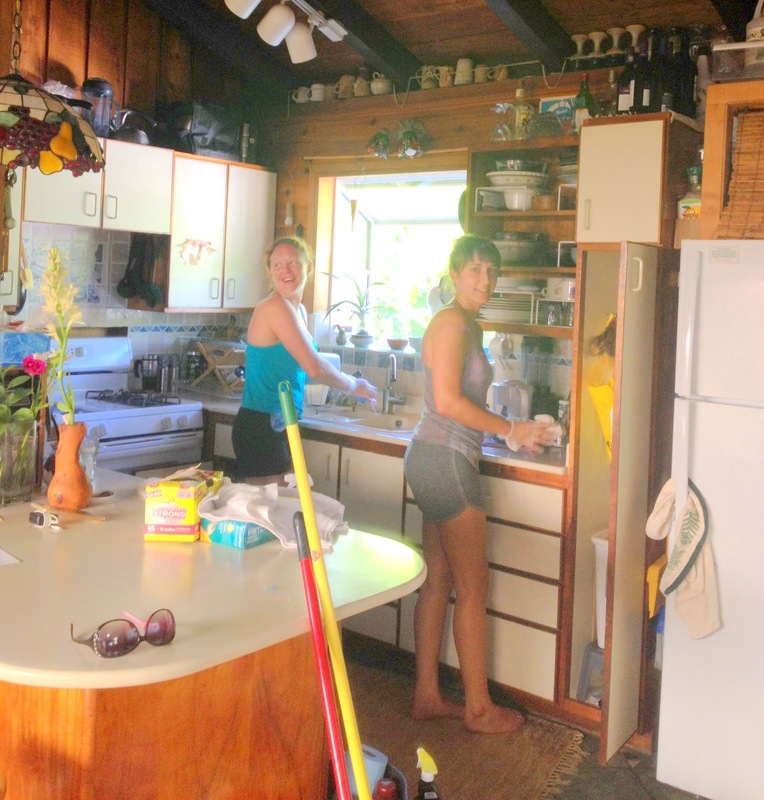 How to make house cleaning more fun on Maui. Disclaimer: Hula Maids provided a free 2 hour basic house cleaning in exchange for a review on my website. No guarantee was made that my review would be positive. An hour before the cleaners were due to arrive, DH and I were having one of those typical husband wife arguments that happen during long term marriages. DH asked me if they were insured? He was suddenly concerned about having unknown people enter our jungle bungalow. Gosh, he’s never been concerned about unknown bugs or geckos entering our house! Were these cleaners bonded? I looked at the website and assured him, yes, they were bonded. But he was still concerned – he hadn’t met them before, so they could be evil boogiemen hacking into our wifi network and gaining control of all our ooooh outdated technology! I found these floppy disks cleaning the house a couple of years ago. 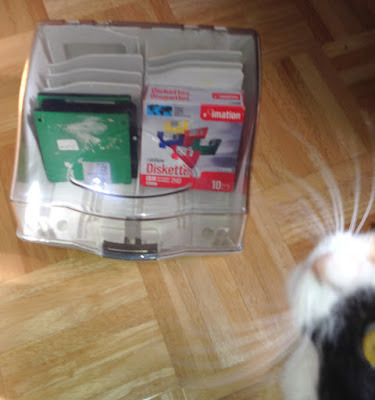 Our cat is embarrassed about this antiquated technology. What would they clean? What would be included in the cleaning? DH insisted that he had asked me to write a list of tasks several days before AND I insisted he had asked me only THE day before. Having different memories is so typical of these husband/wife disputes. I rapidly wrote a list of tasks and we looked at the basic house cleaning description on the Hula Maids website. We gaped at each other. Oh dear, the house was actually TOO clean! How ironic! The cleaners would be done in 5 minutes. The basic house cleaning included a lot of basics but did not include more involved jobs like the bath tub or windows. Uh oh. The bath tub needed cleaning. Hula Maids Screen Shot. At the time of our cleaning, the regular cleaning did NOT include the bath tub. It now includes a LIGHT bath tub cleaning. We were faced with a dilemma. 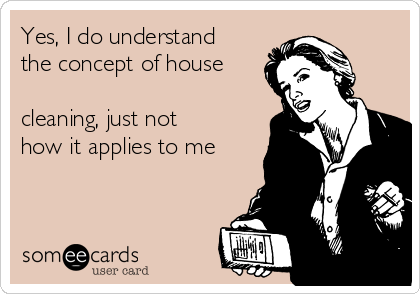 Did we want to waste the cleaners’ time or try to reschedule when the house was more dirty? Which, let’s face it, being Maui, would probably be in another couple of days. It was bad timing and Murphy’s law. The house is never that clean except when a house cleaner is about to show up. Frantically, I called Hula Maids and talked w/ R. What would the cleaners end up cleaning? Was it a waste of time? R. explained that two cleaners would be there for 2 hours, so whatever we wanted them to clean, they would clean, even if it wasn’t on the list of basic house cleaning items. So if the bath tub needed cleaning, then they would do the bath tub. Point settled. Phew! All we had to do was wait for them to show up. When our two cleaners arrived, I felt a wave of relief. They would pass DH’s “ok to enter the house” test. Hate to be so shallow, but first impressions are important. They were not scraggly hippy types with matted, dirt laced dreadlocks wearing stained purple fairy skirts. They didn’t look like they had partied all night and had to drink eight cups of coffee to drag themselves out of bed. They weren’t stoned, eyes glazed and looking at me as if I was a martian, when I spoke. They communicated clearly and were easy to understand. Hula Maids in an "American Gothic" pose. We talked. I mentioned what I thought was worth cleaning and what they should skip. They brought their own equipment and cleaning products. They moved efficiently and easily through the house. They did clean the bathtub, yay! And it was very shiny and sparkly for at least a full week. I did ask for one window to be washed and they didn’t have the right equipment because window washing is not part of a basic house cleaning job. But A. still managed to get the window nice and clean. Hula maids in our jungalow kitchen. Because I find people so interesting, I ended up not working at my desk as planned and kept talking with them and asking questions. In Hawaii, we call this “talk story” when you’re chatting with someone and connecting with them. The two cleaners I’ll call A. and O. rather than using their full names. O. used to be a cleaner with a luxury vacation rental manager on Maui. Once I knew the name of her former employer (perfectionist, over the top company), I knew how great she would be as a cleaner. O. is from Russia and also teaches gymnastics. Her mother was a clean-o-phile and would wake up before the rest of the family to scrub the floor on her hands and knees every morning. O. likes cleaning so much that it was making her boyfriend crazy and he asked her to find a job as a cleaner! The funniest moment was when O. discovered the wind up mouse in the corner. We heard a shriek! Seriously, I wouldn't be surprised to have a mouse in the house... our cat tries to sneak them in ALL the time. DH later got rid of the mouse since it didn't work very well. The cat was NOT fooled by it. 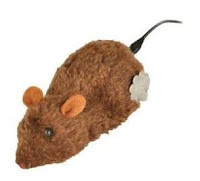 This photo is taken off an Ebay site, if you want to buy a wind up mouse to scare your guests or your cleaner. FYI, I'm not getting a kickback. BTW, I also loved that as O. was passing the wall under the counter, she insisted she had to wipe off the dust which you can only see by looking at the wall a certain way, because the dust was bothering her! O. cleaning the dust off the wall. You can see the dust if you are looking at the right angle. I never paid much attention to it. My husband wants to marry O. A. likes to cook Middle Eastern food and is interested in gardening. A. cleaned the kitchen window, the kitchen table, and the little slotted areas in the back rails of the kitchen chairs as well as the chair legs and the cushions and other things that I would never have noticed. A. was very careful about a tiny ceramic dish of red beans on the kitchen table, lifting it up and setting it back down gently after cleaning one side of the table. I’m often careless about how I empty my pockets after gardening, grabbing everything out of my pocket with grubby fingers, but A. handled my bean seeds like fragile art objects. I was touched. If I was cleaning the kitchen table, I’d probably spill the beans while overreaching to swipe the dust off the edge of the window sill. To avoid such mishaps, don’t clean the window sill. Problem solved. Unless you live with a neatnik. The tiny bowl of red bean seeds that A. handled gently. My husband also wants to marry A. Both cleaners were very careful with all items, moving them gently to the side and then back. They rearranged items slightly so that one knew that the area had been cleaned. No rushed or jerky movements. They climbed up on stools, crawled into the scary bug-infested cabinet under the sink, crawled into the kitchen bay window. They had ipods but didn’t end up plugging in earphones, so it was easy to talk to them at any time. I also loved the vacuum cleaner that A. used. It’s a European vacuum cleaner that is designed to be worn on the back. NO knocking the vacuum into the wall or tables or having it fall over because you’ve tried to overreach with the extension hose. What a beautiful design. I want to marry A’s vacuum cleaner. I am in love with this vacuum cleaner. DH is in love with the cleaner. O. told me that if I think Haiku is hard on houses, that I should go to North Kihei. She says you wipe the dust off the counter. In a few hours, the dust is back on the counter like it never disappeared! Nightmare! Hula Maids brings their own cleaning supplies and offers the option of cleaning with eco-friendly cleaning products. Hula Maids is not for everyone though. People who enjoy haggling or are pake (meaning cheap in Hawaiian) will not be good clients for Hula Maids. 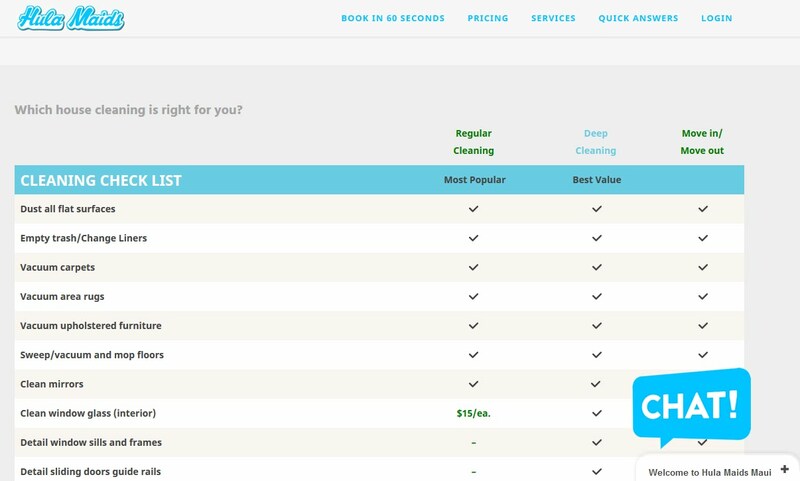 The prices are set prices, and they reflect the price for two cleaners who are well trained as well as the overhead of a cleaning company that has to report income properly to the state. What I’m saying is that private cleaners on Maui can be found for $25 - $40/hour but they want to be paid in cash. They don’t have to report their income. I know of NO individual cleaners who take credit cards. Maybe there are cleaners who take personal checks. I haven’t met one yet. Hula Maids happily takes credit cards. For MOVING IN or MOVING OUT services, I think Hula Maids might be the way to go. My friend's move out cleaning bill was expected to be around $500 - that's what she told me. It was $920! Hula Maids wasn't in business yet. Hula Maids can do quotes in advance so there is no big surprise after the cleaning. Hula Maid A. is climbing in the bay window. O. couldn't resist reorganizing the plastic ware covers! Hula Maids is good for people who want consistent good cleaning and need to know that all days desired for cleaning will actually have a cleaner show up. Private cleaners have their own lives and their own schedules. Many individual cleaners won’t clean on Sundays, don’t like cleaning in the late afternoon, and heaven forbid you should ask them to clean at night! 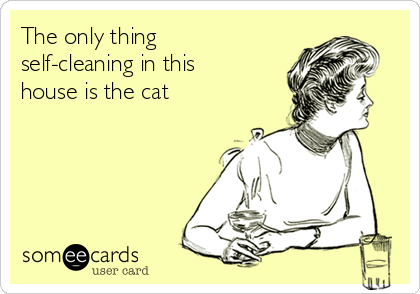 If you need a place cleaned daily for a month, it’s going to be hard to find a private cleaner willing to do that. I know, because I have had to do this for work and there are some days the cleaners are NOT available. With Hula Maids, there is a staff of cleaners, so that should minimize any “missed” days in an intense cleaning schedule. Last thing: Hula Maids is getting pretty popular. It’s a relatively new company, only launched a few months ago and you still have to arrange a cleaning in advance. I’m not sure they can do a cleaning on the same day that you book online or call them. By the way, I’m happy to write reviews for local companies when I have time. I have to be upfront and admit I don’t always write them immediately because my life can get busy - right now I'm volunteering with event promotion for Hawaii Farmers Union, and I want to write a detailed and fun review, which takes time and thought. But you can still contact me!